I am from Faisalabad, Pakistan. Currently in Dubai UAE for more than a year. 2. What is a fun fact about yourself? When I moved to Dubai I got tired having outside food daily because I was never used to it. I am a foodie though but still like to have commercial food occasionally only. So one day a simple recipe that I liked the most from my childhood, tried to cook it following some YouTube tutorial and it turned out to be a success. From that day on I continued to learn the chemistry of different cuisines and focused much on taste, so now I cook really well. The reason why I consider it a fun fact is that in my professional network circle during a casual chat whenever I tell some lady that I cook and cook really well so the gesture I encounter is a shine in their eyes and a strange kind of surprised look, asking me “Like Seriously”. What is the reason behind that I am still trying to decipher. I started my career as a banker and worked with some leading banks in Pakistan. After having elevations in positions and grades in my banking career there came a day when I said to myself enough debit credits and its time to close this account in my professional life. 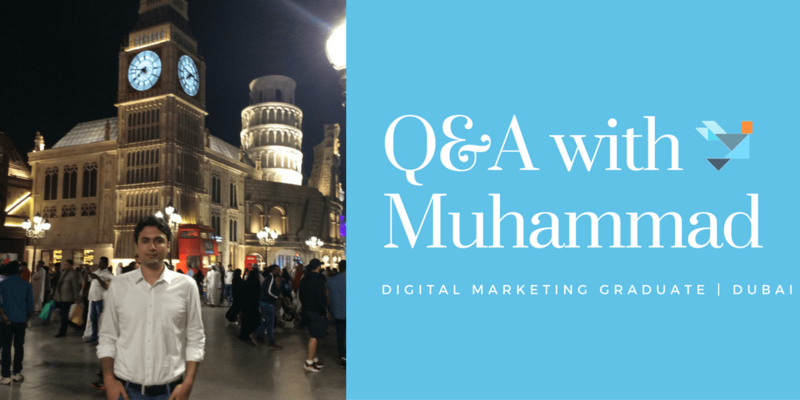 I moved to UAE and here I am having a marketing position in a Digital Marketing firm. 4. What would your dream job look like? It is hard to explain in few words but wrapping it up I would say learning and development. Why because learning is my passion and to serve others with the gained knowledge and encourage them to keep learning is how I feel satisfied. 5. Why did you decide to start the Digital Marketing specialization? In the current job I first came across digital marketing and started to develop knowledge that how it works. Realizing the fact that digital marketing has become a vital tool for almost every business irrespective of its size and type. 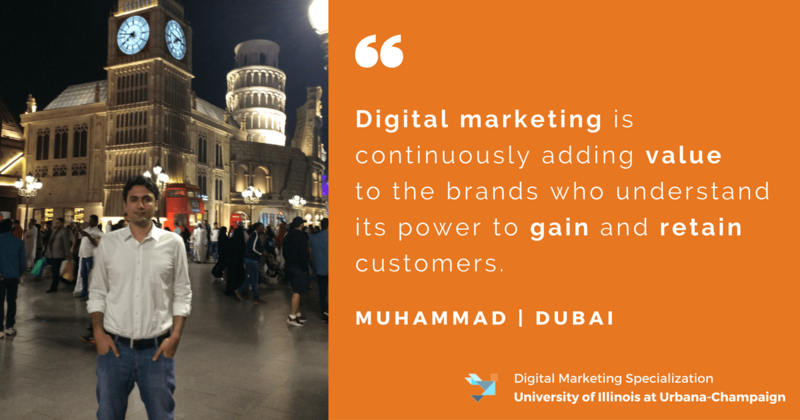 Digital marketing is continuously adding value to the brands who understands its power to gain and retain customers. So for gaining authentic knowledge and advancement in career I preferred to specialize in this field of study. 6. What has been the most interesting thing you’ve learned through the specialization? Learning Digital Marketing on a sophisticatedly designed digital platform is a great experience. A great opening with the first course Marketing In A Digital World with Prof. Aric followed by industry experts Kevin Hartman and Rhiannon Clifton, I would say excellent lectures with quality learning material recommended in each course. Coming to the most interesting thing I have learned in this specialization is that its not just all about memorizing the terms and techniques but developing a professional mindset with strategic approach that can be utilized to solve complex business problems in digital marketing. I learned about that professional mindset while reviewing Hannah S. Fricke assignments and it is really a pleasure to have such an experienced and professionally mature class mate. 7. Have you gotten a chance to apply Digital Marketing concepts in your daily life? Currently my job does not require me to do that, but I do apply those concepts for my own better learning and understanding of my firm’s business domain. 8. How do you plan your schedule to make time for Digital Marketing courses? I dedicate at least 1 hour daily to the course. 9. Do you have any advice for new learners or for those who may be unsure about starting the specialization? This specialization covers major concepts of digital marketing with quality learning experience. Case studies and assignments will develop proficiency in the practical approach of all the aspects taught. Instructors teaching approach is outstanding. I advise all interested learners to consider this specialization as an excellent opportunity to gain high quality knowledge with professional certification in Digital Marketing from an esteemed world class institute University of Illinois at Urbana Champaign. Very glad to meet a Pakistani man who is a good cook. 🙂 Even more impressed by your courage in changing careers and dedication to continuous learning. Nice to meet you! I completely agree with you and think digital marketing is essential for whatever one does. Am looking for a change in career after working mainly for my family business and would finally like to do a startup or work with an existing company. I currently live in Milan Italy so open to suggestions.